In this site you can earn real money for completing various tasks and activities. They pay real PayPal cash not gift cards. They pay weekly via PayPal with a low minimum payout of $10. Facebook account or email Id is enough to sign up. 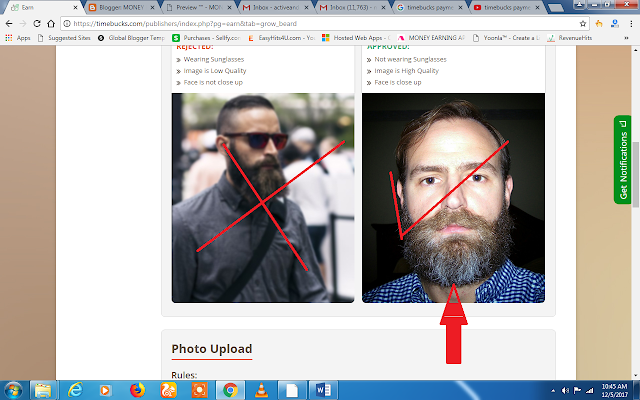 Your can earn money for taking a selfie of your beard growth every day. Take your photo from the first day. The photo should be of clear HD image, no sun glasses (Professional classes are allowed), No back ground images like widget or anything. Upload your photo 2 months on daily basis without any gap between the days, at the end of the 60 th day you get paid 10 $ as a bonus and per qualified photo get paid 0.02 $ instantly. Daily you can upload up to 10 photos. Once you get paid then again you can start the same procedure. Guys those who do not have HD camera please do not try this. 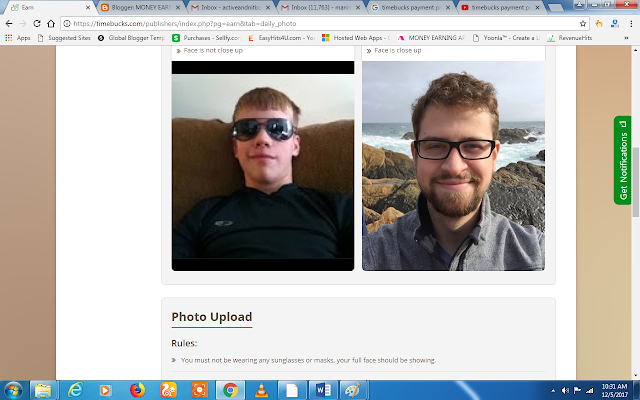 No sunglasses, High quality Image, Face is close-up to the camera, 2 photos per day and approval compulsory. They are giving YouTube views to their client, 1000 views per 2 $. Watching one videos they reward you 0.001 $. 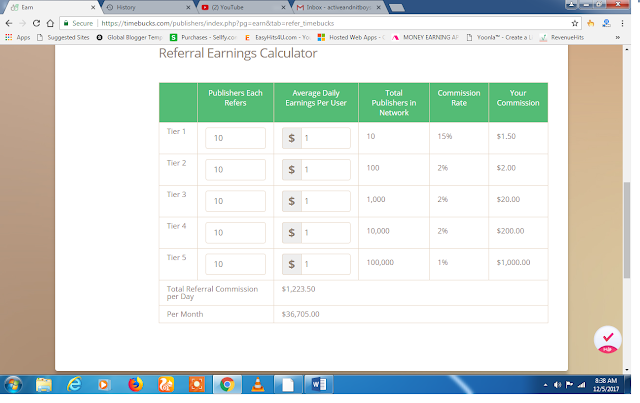 Referral is the one of the best way of earning money. You receive 15 % commission of each friends referred by you. Click here to sign up and start earn. 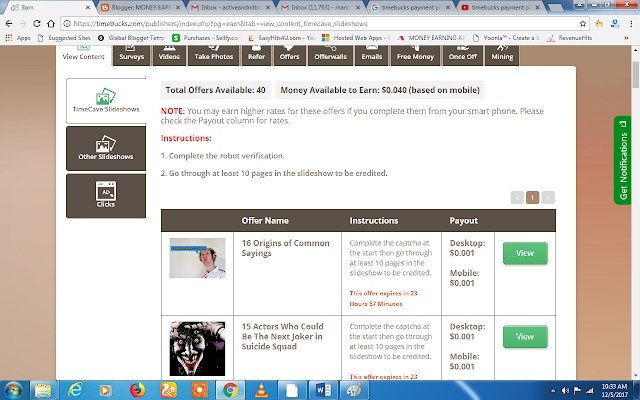 By completing 3rd party surveys like Poll fish, peanut lab, Top research, Adcends media, Revenue wall etc you can earn money. Always try to take peanut lab surveys which is very easy to complete. To get reward until you need to watch slides to the end. Earn up to 0.02$ per slide. Get paid viewing their website links or 3rd party website for at least 10 secs. 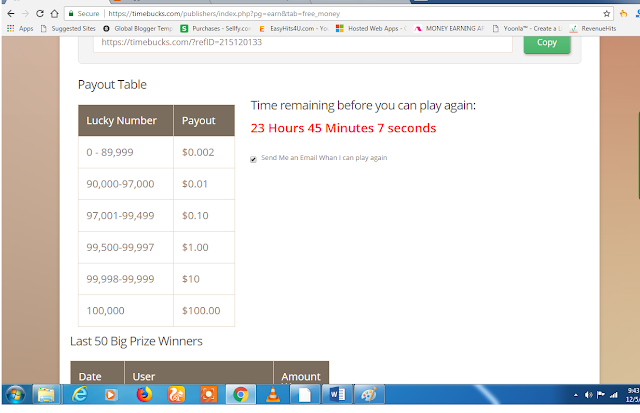 Earn upto 0.01 $. This is just like daily task. After you have done this, come back to this tab and refresh the page so it is removed from the list. You can also start by going to Advertise -&gt; Clicks. Get paid 0.01$ as sign in bonus by completing simple daily poll surveys. This is one time offer. Earn 3 $ by uploading your own created their testimonial video on youtube. The video should be in good quality and 5 minutes’ length in your language. Your Channel must have 1,000 Subscriber. Get paid to read emails. 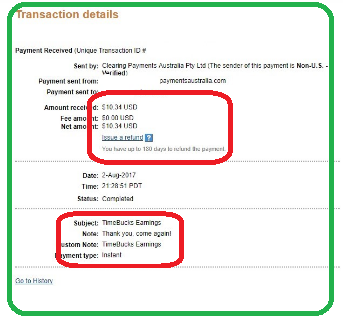 Earn per email from 0.001$ to 0.02 $ by clicking the subject which contain $ symbol. Once your email is verified, you will occasionally receive emails from paid sponsors. Get free money literally. By clicking roll button random number will be generated. The number to prizes list as given below. you will be paid to mine various cryptocurrencies using your computers processing power. You no need to download any wallets, directly they will deposit USD to your account. These set up will slow down your computer, so do not activate on your personal computer. Try different computer which is not in personal use. Sign up bonus: 1 $. Those who have free of time and can get more referral can try this website. The time to cost conversion is low. Without any referral, to earn 10 $ it may take one month. Do not use any proxy or VPN, 100 % they find you and one strike eligible for account standing. if repeat again they ban your account and return your money to their advertiser.